1 Fourdrinier’s engraving shows two additional slim volumes on the extreme left, one entitled Milton, and the open book complete; as a result ‘the figure is centred and the composition is balanced’ as Woolley observed (D. Woolley ed., The Correspondence of Jonathan Swift, II, p 592n2 where he also refers to an engraver’s proof of the unfinished plate in the ‘Bathurst volume’, Pierpont Morgan Library, New York). It is also possible that NPG 278 may have shown this slightly extended composition before lining in 1911. The second Jervas portrait of Swift, painted in Ireland in 1718-19. Jervas was in Ireland from the summer of 1717 to September 1721, possibly returning briefly to London late in 1718. Swift was in Ireland throughout that period. Compared with the earlier Jervas portrait (see NPG 4407), this presents a more engaging image (the head now leans a little towards his right shoulder, the eyes are wider, and the clerical bands are curled). Two portraits of Swift (a kit-cat and a half-length) were in the Jervas sale, 11-20 March 1740, lots 23 and 80 respectively. 1) H. Williams ed., Swift, Journal to Stella, 1963-65, II, pp 300n7, 308, 402. 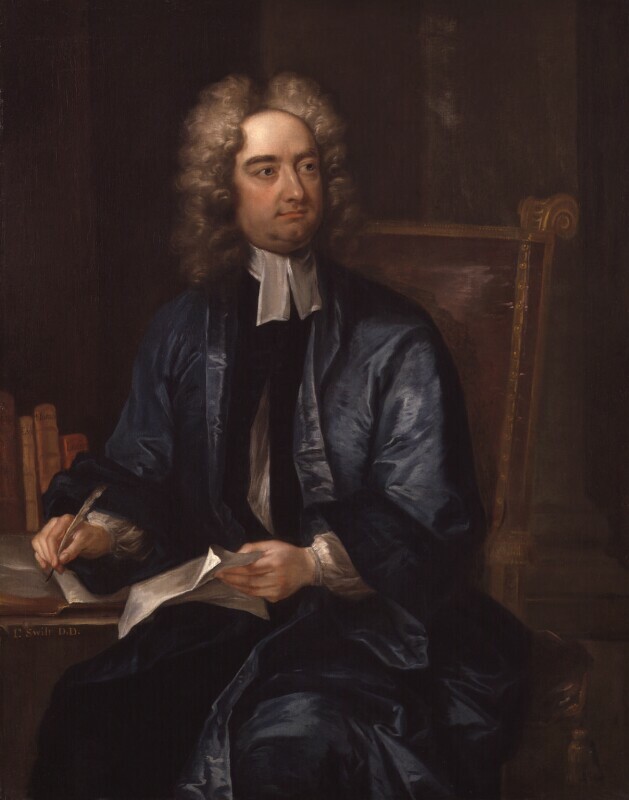 D. Woolley ed., The Correspondence of Jonathan Swift, II, p 195n3 stated Jervas stayed in Ireland all the time 1717-21 (there being no further evidence for Jervas’s return to London late in 1718 following the suggestion by Swift in his letter to Ford, 20 December 1718; D. Woolley ed., The Correspondence of Jonathan Swift, II, no.488). 2) G. Faulkner ed., Swift’s Works, 1768, XIX, 73n, see D. Woolley ed., The Correspondence of Jonathan Swift, II, p 592n2. 3) Oxford sale, 3rd day, 10 March 1742, lot 37 Dean Swift by Mr Jarvis [half-length, i.e. 127 x 101 cm], bought Boden, who often acted for Lord Chesterfield. 4) D. Piper, ‘The Chesterfield House Literary Portraits’, in R. Wellek & A. Ribeiro eds., Essays in Memory of James Marshall Osborn, 1979, p 191, no.13, pl.25; presumably cut-down from a three-quarters, though there is now no sign of the gown having once been blue and there are detailed differences from the Fourdrinier plate in the folds of the drapery and the curls of the wig, see D. Woolley ed., The Correspondence of Jonathan Swift, II, pls 8, 9, where print and painting are illus. side by side. G. Vertue, Notebooks, Wal. Soc., XXVI, 1938, p 70, recorded Lord Chesterfield collecting portraits of poets for his new library; some were originals and many others ‘Coppyd to the size he wants’. 5) HMC Portland, V, 1899, p 638. 6) H. Williams ed., The Correspondence of Jonathan Swift, 1963-65, III, pp 84, 85,92; D. Woolley ed., The Correspondence of Jonathan Swift, II, nos.660, 661, 666. 7) N. Figgis & B. Rooney, Irish Paintings in the National Gallery of Ireland, 2001, pp 309-10; acquired from the Berwick collection 1875. D. Piper, Catalogue of the Seventeenth Century Portraits in the National Portrait Gallery 1625-1714, 1963, p 278. D. Woolley ed., The Correspondence of Jonathan Swift, II, p 592n2. 1 MS Inventory, Huntington Library, San Marino CA. 2 Graves told the Chairman of Trustees, W. Smith, ‘Swift was knock’d down to me at 50 gns but claimed afterwards by another person & it rose to 100 gns & I got it 50 gns less than I should have given myself’ (letter of 25 February 1869; NPG archive). Aspects of Irish Art, Columbus OH, Toledo OH, St Louis MI, 1974, no.30; The World of Alexander Pope, Yale Center for British Art, 1988, no.31.